It can scarcely be denied that Samuel Colt was one of America’s first tycoons, a Yankee peddler who became a dazzling entrepreneur. The success of his many mechanical inventions and refinements was due less to their intrinsic merits—which were considerable—than to his showmanship. He achieved his goals despite continual adversity and made his mark in Hartford—and in the world—during what amounted to a relatively short life. 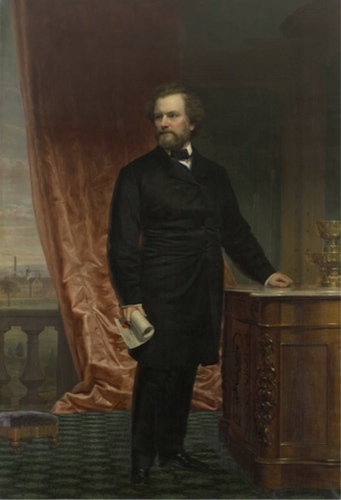 Born in Hartford in 1814, by his 16th year a young Samuel Colt yearned for adventure and persuaded his father to let him go to sea. He found work on the brig Corvo, bound for London and Calcutta. During his trip Colt conceived, by observing the action of the ship’s wheel (or possibly the windlass) a practical way for making a multi-shot pistol. He whittled the first model of a rotating cylinder designed to hold six balls and their charges. The idea was to enable the pawl attached to the hammer of a percussion gun to move as the gun was cocked, turning the cylinder mechanically. Colt thus became the inventor of what would be the definitive part of the first successful revolver. Colt returned to Boston in 1831 with a model of his projected revolver. With money from his father he had two prototypes fabricated, but the first failed to fire and the second exploded. Out of funds, Colt had to scrimp to make his living and to continue the development of his invention. In December of 1837, Colonel William S. Harney, struggling to subdue the Seminole Indians in the Florida Everglades, requested one hundred of Colt’s newly improved guns. The weapons failed to impress the army’s stubborn head of Ordnance, Colonel George Bomford, however, so it was not until the summer of 1840 that Colt actually managed to obtain the order. Unfortunately, because his other sales proved too meager to sustain his business, Colt had to fold his company in September of 1842, leaving him in debt. The outbreak of the war with Mexico, however, brought new demands for Colt’s guns. The five-shot Paterson pistol, having won acceptance against the Seminoles in Florida, gained further renown in the hands of the Texas Rangers. Impressed with their performance, General Zachary Taylor (commanding troops in Texas in the autumn of 1846) requested one thousand Colt revolvers. 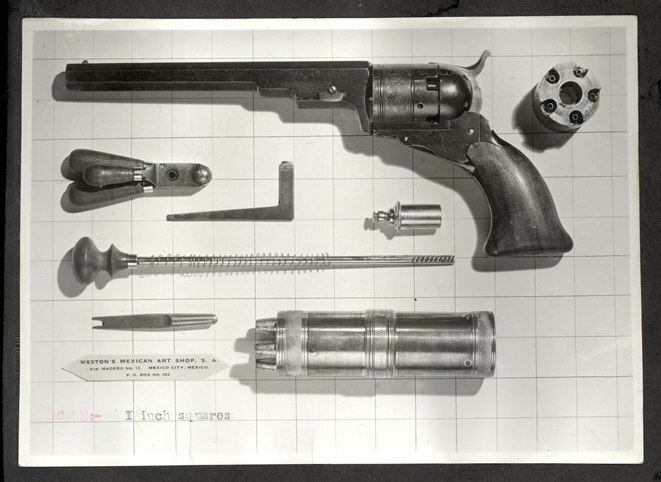 Armed with a $25,000 government order, Sam persuaded Eli Whitney Jr., the Connecticut contractor for army muskets, to make the thousand revolvers. They were ready six months later. His appetite whetted, Colt obtained an order for another thousand guns. He borrowed about $5,000 from his banker cousin Elisha Colt and other Hartford businessmen, leased a factory on Pearl Street, and hired scores of hands. Thus, in the summer of 1847, Colt started his own factory, promising to turn out five thousand guns a year. Alert to the new methods being used in New England’s machine-tool industry, Colt quickly adapted the system of interchangeable parts to the mass production of guns. Though two other Connecticut gunmakers (Simeon North and Eli Whitney) had been the first to standardize parts, Colt perfected the technique to the point where 80 percent of his gunmaking was done by machine alone. Colt successfully obtained a seven-year extension on his basic American patent and crushed any competitor’s attempts to infringe upon it. He became a millionaire in less than a decade. 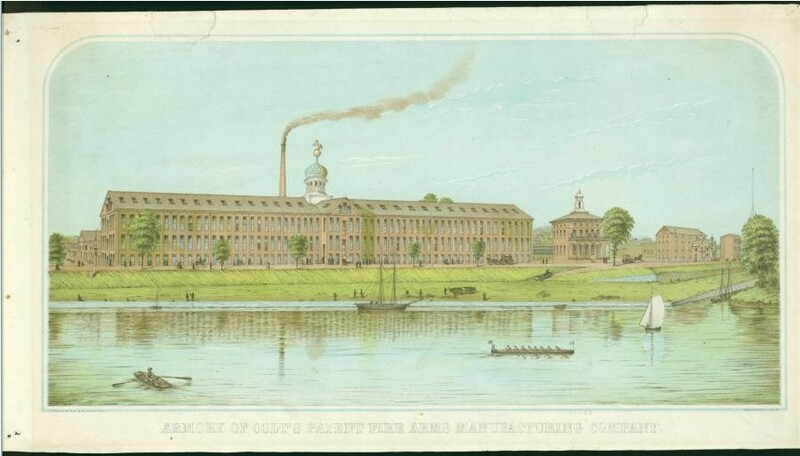 Dreaming of building the largest private armory in the world, in 1851 Colt began buying up Hartford property in the South Meadows that fronted on the Connecticut River. As lowland, it was swampy, prone to spring flooding, and considered of little value. Eventually Colt acquired 250 acres of property there and erected an armory of Portland brownstone. On top of the armory he raised an elaborate onion-shaped blue dome, supported by columns and crowned by a golden sphere on which perched a rampant colt holding a broken spear. Construction on the building finished in August of 1855, and in just two years Colt began turning out nearly 150 finished guns a day. Shortly after the armory’s completion, Colt married the gracious and gentle Elizabeth Jarvis, who at 30 was 12 years younger than he. 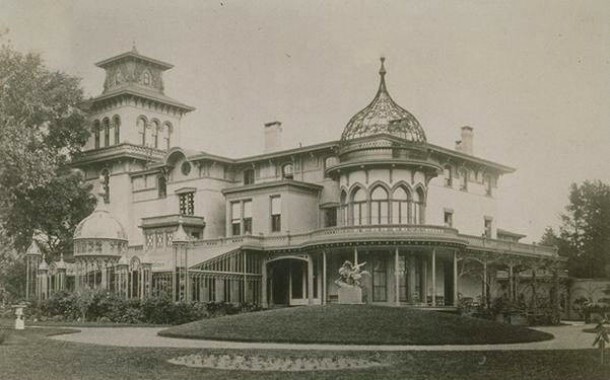 The extravagance of their wedding, on June 5, 1856, was the talk of Hartford society. Before an immense crowd of spectators the couple boarded the steamboat Washington Irving (which Colt chartered for the occasion) in front of the flag-bedecked armory, and Colt mechanics fired a rifle salute from the cupola. Two days later the Colts embarked on a six-month trip to Europe. On their return, Sam began to build his palatial Armsmear estate on the western edge of his Hartford property. Elizabeth saw little of her husband, however, as the North and South raced toward Civil War, Colt was busy making enormous profits by filling the armament demands of both sides. But Colt’s immense business responsibilities began wearing him down. Bothered by frequent attacks of inflammatory rheumatism and distressed by the death of an infant daughter, his health steadily declined. Colt died on January 10, 1862, at the age of forty-seven.